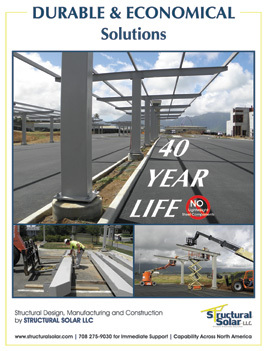 Structural Solar LLC is a leading design-build company who specializes in cost effective attractive solar canopies for institutional, municipal and commercial solar installations. The architectural solar canopies can have a single slope or a curved design and cover large parking areas as an efficient alternative to rooftop solar installations. Structural Solar manages the design, fabrication, coating and installation of foundations and “module-ready” solar structures, most notably architectural solar canopies in parking lots or common areas of the property. As a solar canopy company, Structural Solar designs to stringent specifications assuring durability and long term customer satisfaction. Moreover, Structural Solar provides customized but affordable designs to meet the most demanding critics. Proven industrial -marine grade paint systems make the structures virtually maintenance free for their design life. Structural Solar utilizes an ultra-efficient design process and can take the project from concept to completion quickly and seamlessly without the premium costs typically associated with higher end architectural quality structures. Accordingly, the company has become the premier solar canopy supplier for solar installations on the East Coast, Midwest and mid-Atlantic regions, and continues to grow across the US and Canada. For more information on how Structural Solar can make a difference in your project, visit the company’s website or call Bob Pegnato at 708 275-9030 for immediate service.